More people everyday discover the power and convenience of enjoying their own music everywhere, because of our open API and the efforts of our various hardware device and software development partners. MP3tunes features an open Music API for streaming and syncing music between the Music Locker and listeners' computers and devices. Find out more. Join MP3tunes in shaping the future of digital music! To discuss adding the Music Locker to your product or service, please contact us. Your music on the go: iPhone/iPod touch, Android phones, Windows Mobile and more! Browse and play your iTunes music and all your music through your TV... with just your remote. 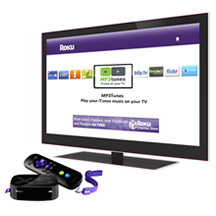 Roku players set up in minutes to connect wirelessly and let you enjoy your music, Netflix, MLB TV and many more popular channels.